About the Book: For Kate Bennet, surviving the car wreck that killed her parents means big changes and even bigger problems. As she begins to see auras and invisible people, Kate must learn to trust Patrick O'Donnell, a handsome Guardian, or risk her life being overrun with Demons. She soon realizes that both she and her heart are in big-time trouble. Can you tell readers a bit about yourself and your writing journey so far? I read voraciously as a kid. I loved picking up a book and entering a whole other world, but I was raised in a small town with a small library, and I was quickly running out of materiel. I don’t honestly remember what triggered the thought, but I suddenly had the crazy notion to write my own book. After all, I knew exactly what I wanted in a story—the most fascinating character traits, the coolest plot twists, the best elements to make an entertaining read. So off I started writing, and about six months later I had a novel. It won’t ever be published—it’s the biggest cliché I’ve ever seen, but I was very proud of it, and it helped me find my niche in the world. I immediately started on my next writing project. I learned that I could write a novel in first person, and in the modern settings—two things I’d never attempted before. I also learned that I could insert a lot of my personal experiences and beliefs into my characters. Seers really came from a desire to express some of my feelings about losing my little brother, back in 2008. I have my religious beliefs about life after death, but I wanted to write a novel that could explore some of those ideas. Those musings led me to create my Guardians and Demons. I’m inspired by the people in my life—mostly my family. I’m also inspired by other books that I read and stories I hear. I’m constantly keeping an eye out for new ideas, looking for the next great plot twist . . . Even when I’m not writing out my ideas, I’m constantly writing in my head. What are three favourite books and why? “Jane Eyre”, because it’s one of the most beautiful love stories every written. Jane is an amazing heroine—ordinary, but inspiring because she remains true to herself, no matter what. “The Scarlet Pimpernel”, because Sir Percy Blakeney is just about the coolest hero ever conceived. 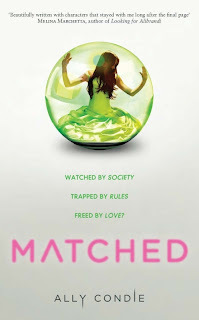 And I recently read “Matched”, by Allie Condie, which I loved. The writing is simply beautiful. Just write! Finish that novel, and then believe in yourself and your characters enough to put your manuscript out there. Remember, if you have a dream that you’re willing to work for, no one can stop you. Also, realize that rejection is a part of the writing life. The day rejection stops is the day you stop writing. Is there anything specific you want to say to readers? What did you think of the interview? Doesn't Seers sound so interesting? ?